Currently the largest shopping mall in Melaka city, Dataran Pahlawan Melaka Megamall (DPMM) hosts over 11 million visitors a year, making it a major local attraction in the area. With over 700 retail units spanning 1.5 million sq ft, DPMM is the thriving pulse and heartbeat in the Melaka Raya precinct. 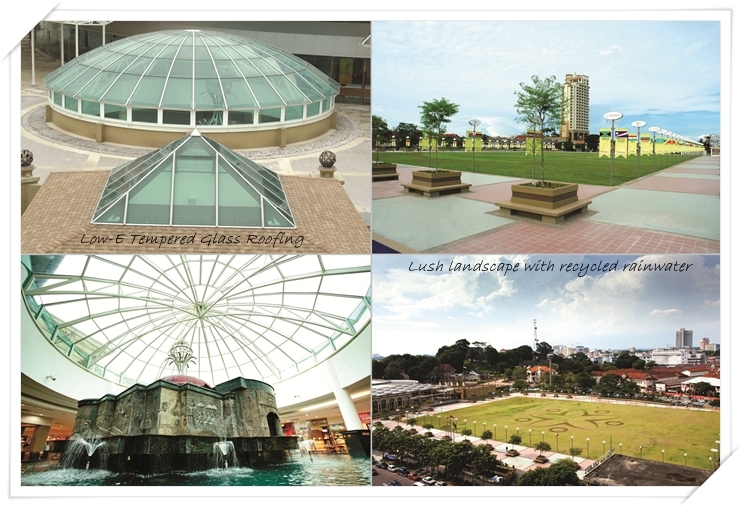 Impressive as it is, DPMM is not just another retail mall, it is also a development with a heart. From the initial planning stage in 2006 till today’s daily operations, the DPMM team is always conscious of our responsibility towards Mother Earth and the surrounding environment. In building DPMM as a more eco-friendly development, construction included recyclable shingles roofing, ‘Peri’ formwork system for faster casting, pre-stressed beams and slabs systems to lessen construction time and onsite batching plants to reduce delivery of concrete supplies. Low-E tempered glass admits natural sunlight , reducing electricity consumption during the day. Plus, an eco-membrane segregates and collects rainwater which is used to water the lush natural landscape. Internally, we use recyclable drywall partitioning and eco-friendly sanitary-wares such as toilet paper made from recycled paper. Throughout the mall, recycling bins are placed beside regular bins to encourage shoppers to recycle. This is just a small part we play in the larger global scheme for protecting the environment. We also organize eco-friendly mall campaigns for DPMM and Hatten Square to share the message amongst our shoppers. We believe that if we all do just a little bit for the environment the collective impact will bring about significant change, moving towards a cleaner, greener earth. Watch this space for more info on upcoming environmental events happening in our mall. This entry was posted on May 3, 2013 by Hatten Cares in Hatten ♥ Eco-Dev, Hatten ♥ Mother Earth and tagged community, conservation, eco-building, eco-development, Eco-friendly, energy, environment, environment-friendly material, investment, Malacca, malaysia, Melaka, Recycle, retail, shop, shopping, shopping mall, tourism. Enter your email address to follow the Hatten Cares blog and receive notifications of new posts by email.